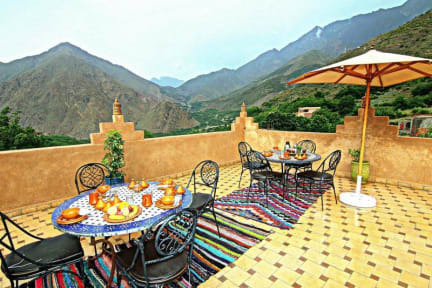 Atlas Mazik Lodge is a new but authentic guesthouse in Imlil at the foothill of Mount Toubkal High Atlas Mountains The accommodation have salons and panoramic roof terrace. The house has a stunning view of the Berber villages and over the Atlas Mountains. The guesthouse was set to provide a good level of comfort, tranquility and nature iscovery. Our staff will be at your disposal and will do their best to cater to your needs in your new home in the Atlas Mountains. Atlas Mazik Lodge is a new but authentic guesthouse in Imlil at the foothill of Mount Toubkal High Atlas Mountains, located in the south of Marrakech at only 67km away from the centre of Marrakechand from the international Marrakech airport. Atlas mazik is just at 15 minutes by foot from Imlil center and at 2k m from the Toubkal national park. Imlil is the starting point for trekking, hiking and climbing the Mont Toubkal summit, the highest peak in the North Africa. We offer 5 ensuite rooms with private bathroom & 3 of them with balconies. . All the rooms have been built in a Berber style & Tadelaket, the typical Morocco’s architecture. Check out from 06:00 to 14:00. One of the best breakfasts we've had. Location amazing. Plenty of space to hang out, comfortable rooms. Staff friendly, helpful, incredibly accommodating. The perfect place to stay for enjoying imlil, or jumping off point for a treck in the mountains. Our only complaint is that we wish we had had more time! Atlas Mazik was really wonderful. It was quaint, comfortable, and charming. Hussein made us feel so welcome the entire time, and answered all of our questions to help us in town and around. If we go back to Imlil, we would definitely stay again! Thanks so much! Unfortunately on arrival we were told we would not stay in Atlas Mazik lodge because the owner gave our room away to a larger group booking. However, he did offer to put us in his father's lodge, and pay for 2 night rather than 3. His father's place was basic and did not have a private bathroom like we booked. However, his brother Hassan and other family were nice. The food was lovely and atmosphere good (but food was always about an hour later than expected). Overall a good Berber experience.